My foolproof method for cooking dry beans, plus it makes broth and veggie soup at the same time. Pour out the dry beans into a shallow bowl, a bunch at a time, and pick through them. 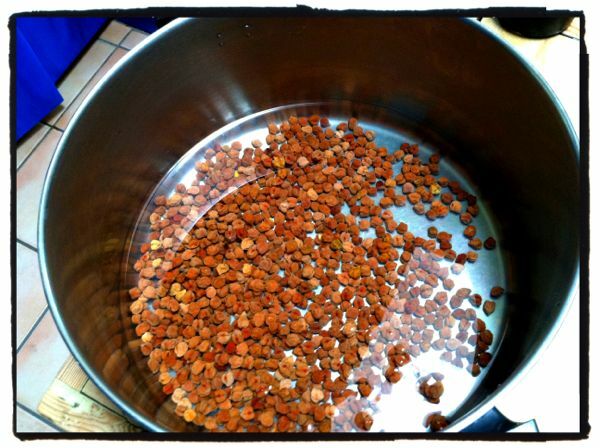 Remove any pebbles, sticks, or discolored beans. Some people remove broken beans. I'm not that picky. But yes, I've found pebbles before so don't skip this step. This takes about five minutes. Why, lookee here! 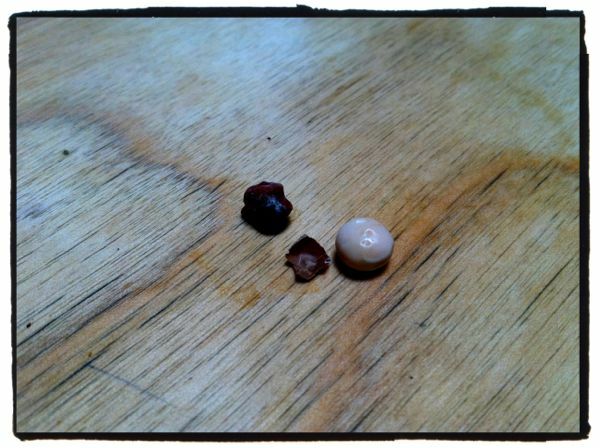 What's that random white bean doing in with the dried black garbanzos? And what's up with that teeny tiny funky garbanzo? This is why you sort beans. Put the sorted beans in a large pot and rinse and swirl with enough water to cover them. I use tap water for this step. Drain completely. Use enough filtered water to cover them completely, assuming they will double in size after soaking overnight (8-12 hours). 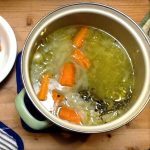 Scrub the carrots and celery, cut off the tops and bottoms, and cut into three large chunks. Cut off the stem end of the onion, then cut it in half lengthwise through the root end. Peel off the papery skin. If you want onions in with your beans at the end, slice the onion lengthwise. If you want the beans to go off by themselves and have another beany life in a different recipe, quarter the onion. If using spring onions, leave them whole after washing them well and removing any poor leaves. Smash the garlic cloves with the flat blade of your chef's knife. Kapow! Remove the papery skin. Scrub the potatoes, peel if desired, and cut into large chunks or small dice. (If you want potato dice in your beans at the end, dice the potatoes. If you want to be able to fish the pieces out, cut into quarters.) If you don't eat white potatoes, skip them or try a sweet potato or a couple of parsnips. It's all good. Tie the washed fennel fronds and thyme sprigs into a bundle with some clean kitchen twine. Add the bay leaves, salt (if using), olive oil, and filtered water. This is what it looks like with everything in the pot before cooking. Vibrant, soon-to-be-deliciousness! Bring just to a boil with the lid on the pot, then turn down to a simmer (just barely bubbling). Check the beans after 30 minutes. You want them to be nicely tender but not falling apart. If you are going to make baked beans, you want them to still be pretty firm. Depending on the size of the beans, they cook in 30-120 minutes. After an hour or so, once the beans are tender, it looks like this. Once the beans are done, remove the herb bundle and bay leaves and compost them. Fish out the large chunks of veggies with a slotted spoon. You can mash those up for a puree, or blend them with some of the Brothy Deliciousness (BD) and make a lovely veggie soup the next day. Drain the extra BD into a container. 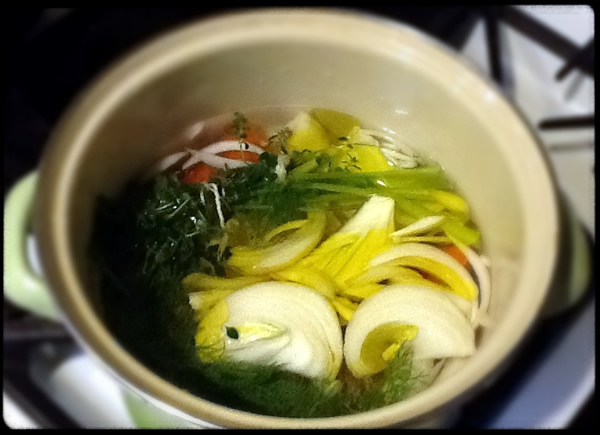 Use it to make gravy, sweet pea soup, or in place of water to cook rice, quinoa, or millet, for more OMG deliciousness. Serve the drained beans as is, or use them in any recipe calling for cooked beans. You can freeze the beans. I freeze them pre-measured in one- or two-cup containers so I can thaw them for a specific recipe. Non-U.S. readers: Dried beans are sold in one-pound packages in the U.S. You can use 1/2 kilo in this recipe, and it will turn out just fine. For my baked beans, I used small white beans, but navy beans or any kind of small brownish or white bean will work. 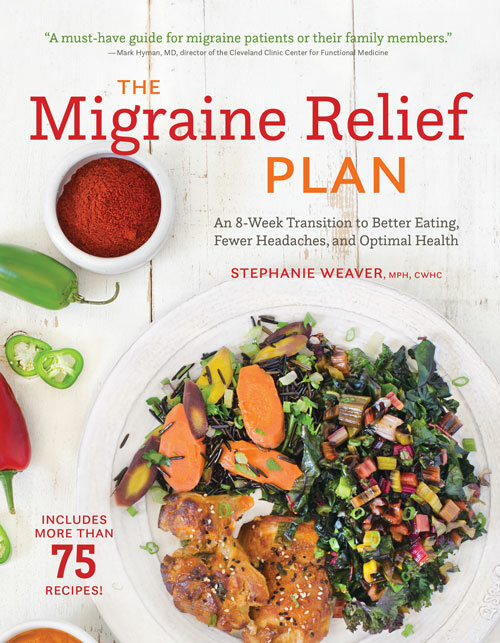 Migraine diet: Use with any dried bean except fava, broad, lima, or navy bean. Very low-sodium diet: Omit the celery. Hi Stephanie – I love that this 1 recipe makes 3 different dishes. Cooking beans with aromatics gives them so much flavor (unlike the bland beans in cans). I like to cook beans with garlic and rosemary, but I want to try your recipe too. Thanks for the inspiration. 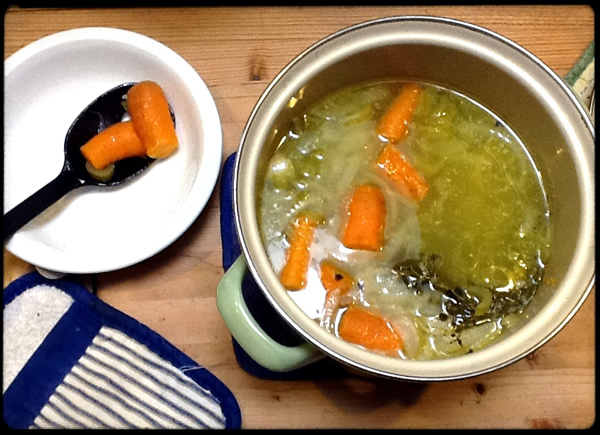 Now here’s my question– do you know if the bean broth is full of gassy ingredients? Hi Dana, I have to give credit to Tamar Adler and her book for inspiring me to think about cooking beans differently. As to your second question, soaking the beans and changing the water does a couple of things to prevent gas. It starts the beans along the way to sprouting, which makes them much more digestible. And it breaks down and removes some of the oligosaccharides (natural sugars) that cause gas. So, I have not found an issue with the brothy deliciousness causing gas. Hi Stephanie- thanks for your reply. I’m new to cooking my own beans, so I have an additional question. From your experience, is the extra step of soaking beans worth it and is it essential? I have made some beans without soaking, and they seem to come out fine. Dana, I don’t usually take the time to soak lentils or split peas, but I do see benefits to overnight soaking. As with my other comment, it makes them much more digestible, which is good both from a nutrition and a gas point-of-view. Loks a great recipe, giong to try it. Looking for an alternative to the tinned stuff full of salt and sugar. This really is the most amazing way to cook beans. I was making it to use for your baked beans recipe, but had to save half just to eat it as a soup- it was that good. I shared the recipe with my mom and she loved it too! I am making it again today. Thanks so much for this tremendous recipe. Thank you so much for making my bean-making life so much easier! This is such a wonderful way to flavor the beans and get some homemade broth to use in other recipes. You are welcome! I’m ever so grateful to Tamar Adler for describing her method and inspiring me to turn it into an actual recipe. Thanks for saying hello! i must try this! i have some adzuki beans i need to cook up…. Looks delish! And I love the multi-purpose broth/cooking water idea. I would wonder about whether I could fish out all the veggies if I were making beans for, say, a bean salad–did you have any trouble separating the two? If you are planning on using the beans as an ingredient in another dish, peel the potatoes (if using) and cut carrots and celery in large chunks (about 3 per carrot or stalk). Leave most of the stem end on the onion and quarter it so it won’t fall apart. Then you can easily remove everything and strain out the brothy deliciousness for another use.